WAPAKONETA – In the past two weeks, Wapakoneta has gritted out two exciting victories. 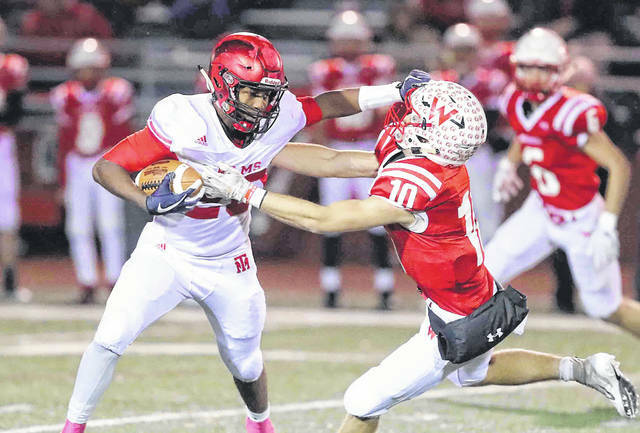 The Redskins pulled out an incredible come-from-behind last second win to beat St. Marys, 24-22, in the final game of the season and then followed it up with another big win over playoff nemesis Trotwood-Madison, 24-21, in the first postseason game Friday. In both games, the Redskins have had to rally to record wins and all while dealing with injuries and fatigue. Now the bruised and battered Redskins must get up for its second round playoff match against Bishop Fenwick at 7 p.m at Piqua Alexander Stadium Friday night. Moyer added that the team has needed players to step up as the Redskins deal with nagging injuries and points to players like Jeven Woodruff who made a big play against Trotwood-Madison to help the Redskins win. Moyer said his concern about his team is playing such high level of competition it has been both physically and emotionally draining for his squad and he said he has challenged his team to continue to grind as they prepare for Bishop Fenwick (10-2). Moyer added that film study comes extremely important during the playoffs because of the lack of knowledge of their opponent. The Falcons come into the game riding a six-game winning streak and their lone two losses came to state ranked squad. In 11 games, Sully Janeck has passed for 1,952 yards and 18 touchdowns. Against Chaminade-Julienne in the first round, the senior signal caller has a crisp 14 of 23 for 190 yards and two touchdowns. Senior tailback Jack Fessler is the Falcons’ top ground gainer with 1,737 yards and 24 touchdowns. In their first playoff game, Fessler racked up 64 yards and two touchdowns. Receiver Thomas Vogelsang has 38 catches for 741 yards and eight touchdowns. During the regular season, Fenwick’s offense averaged 33.2 points a game and 223 yards rushing and 176.2 yards passing. Defensively, the Falcons are giving up 18.2 points a contest and yield an average of 194 yards on the ground and 137 through the air. Senior defensive back Henry Nenni is the top tackler on the team with 132 total tackles and one interception. Linebacker Leo Bell has recorded 108 tackles for the year. Columbus Grove won its first postseason game, 21-7, over Carey and now the Bulldogs set their sites on Attica Seneca East. Riding a six-game winning streak, the Tigers are coming off a 33-9 win over Loudenville in their first postseason matchup. Tiger quarterback Chase Foos has passed for 1,491 yards and 16 touchdowns with five interceptions. Spearheading the ground game is Blaine Swartzmiller who led the Northern 10 conference with 2,067 yards and 25 touchdowns. He is averaging more than 180 yards per game and against Loudonville he gained 255 yards on 30 carries and four touchdowns. D.J. Ruffing is Seneca East’s top receiver with 29 grabs for 329 yards and one touchdown. Lima Central Catholic is coming off an impressive 40-18 win over Covington in the first round of the playoffs. The Thunderbirds will have their hand’s full against a tough Marion Local squad who posted a 55-7 win over Spencerville. The Flyers running back Nolan Habodasz had three touchdowns and quarterback Nathan Bruns through for a trio of scores. Defensively, Marion Local held Spencerville’s vaunted running game to 110 yards on the ground. The Thunderbirds come into the game having rushed for more than 356 yards on the ground. Familiar foes face in the second round of the playoffs as Midwest Athletic Conference rivals square off . Coldwater had no trouble in its opening round playoff game by dispensing of Cincinnati Deer Park 49-14. Coldwater quarterback Jack Hemmelgarn was 14-for 23 for 215 yards. St. Henry is also coming off a big first round win after beating Mechanicsburg 37-7. The Redskins rolled up 298 yards and limited Mechanicsburg to 116. St. Henry running back Zach Niekamp rushed for 124 yards and two touchdowns and quarterback Sam Lefeld was 10-for-12 for 111 yards and one touchdown. During the regular season, St. Henry defeated Coldwater 28-10.